MC34-A 38W vacuum tube remote controlled stereo integrated amplifier. 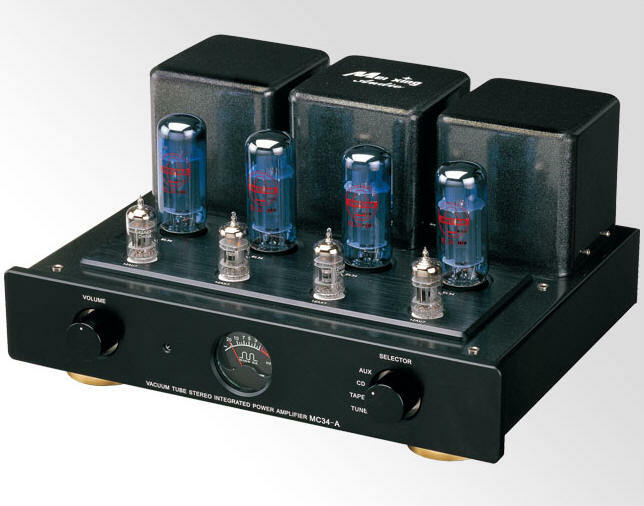 This amplifier produces 38W RMS per channel using the famous EL34 tubes. The black aluminum chassis of the Ming Da MC34-A is made of space-grade aluminum, which was chosen to take advantage of the material's anti-magnetic and anti-vibration properties. It also comes with a modern lightweight aluminum cage to protect the tubes. Selected Blue Tesla EL34 tubes are chosen for the excellent noise characteristics and rendition qualities. The Ming Da MC34-A comes complete with an infra-red remote volume control and aluminum/acrylic tube protection cover.